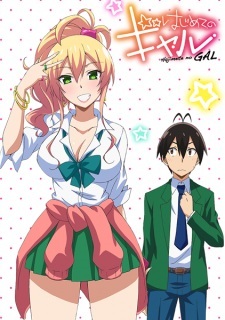 The official website for Hajimete no Gal TV anime has announced cast members. The anime is slated to air in Summer 2017. AnimeJapan 2017 stage for the anime titled "Hajimete no Gal 'Hajimete no' Stage" will be held on May 25 via Kadokawa Booth, and Yuki Nagaku will attend it. Drawn by Meguru Ueno, the romantic comedy manga has been serialized in Shounen Ace since November 2015. Kadokawa published the second compiled volume in October 2016, with the third volume scheduled for March 25.
or they will make it in standard 22 minute by adding some filler. I love that. I am pretty much sure that this anime will be like okusama seitokaichou. That's what I thought. The lenght of each epiosde will no more than 10 minutes I guess. Is there enough content for an anime yet? I think it only has 30 chapters if that. Junichi's childhood friend who became a gyaru because she thinks he's only into them. She appears in like the mid 20s. Though, I guess the translation is different because her name was translated as Nene in the manga. I have a feeling the episodes won't be full length long for this. PV should also appear at AnimeJapan. Pure gyarus are a treasure. Mika Jougasaki getting her own anime.